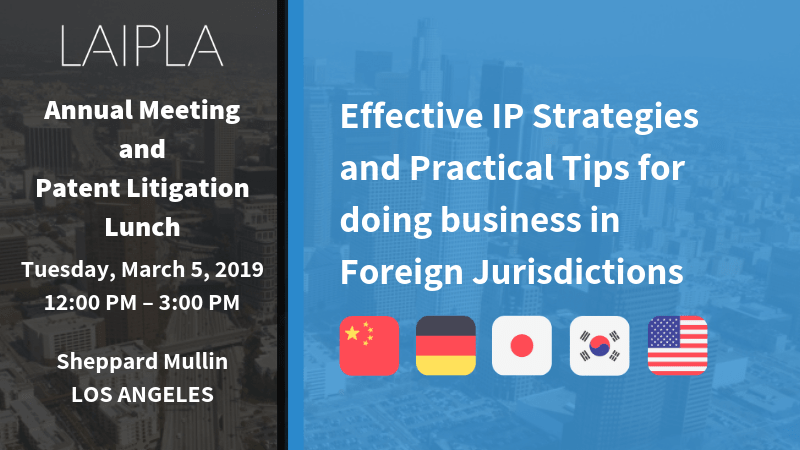 LAIPLA - Spring Annual Meeting: “Effective IP Strategies and Practical Tips for doing Business in Foreign Jurisdictions"
Spring Annual Meeting: “Effective IP Strategies and Practical Tips for doing Business in Foreign Jurisdictions"
Parking is available in the building for $45, but is not included in the pricing and will not be validated. Los Angeles Intellectual Property Law Association (provider # 2083) certifies that the Spring Patent Luncheon has been approved for MCLE credit by the State Bar of California in the amount of 1.0 hours. By registering for this event you are guaranteeing your spot. Refunds will not be issued unless received by cancellation date. Please see cancellation policy for details. In order to receive a refund, notice of cancellation must be received by Friday, March 1 to office@laipla.net. Refunds will not be issued for cancellations received after Friday, March 1.